Presentation on Education 2000 by John Abbott, Director of the Trust, and interdiction by Brian Corby, Chief Executive of The Prudential Corporation. Young people are a Nation’s most precious resource. On the quality of their education our future – our pensions if you like – depends. Let me tell you a story. Long ago, in 1927, Mercedes Benz produced 1700 cars. With amazing long term vision the Directors called for a report on the company‘s growth potential over the next 50 years. Eventually the report came back. By 1977 it said, technological change could make possible the production of 40,000 cars a year. The Directors were appalled at the report which they saw as being naive – how could schools ever train 40,000 chauffeurs a year! We may smile at some of these assumptions… but are we sure that we can do better? The 21st century is little more than 12 years away. Nation after industrialised nation is responding to the economic threat posed to its culture and standards of living by the emergent economies of the Pacific basin and elsewhere by investing heavily in the intellectual development of its youth. Brain power is at a premium; flexibility based on education is the essential requirement to meet the challenge of change. At long last the relevance of education to the state of the national economy has been recognised. Academic success alone is no guarantee that a young person is empowered to tackle the challenge of modern society with confidence. That is why our watchword is “Educating People for Change”. Industry Year helped us to recognise essential skills more clearly; we need people who can think, communicate, cooperate… make decisions. People with the confidence to stand on their own feet. These skills have not been the hallmark of too many of our young people – but they need to be; these are the skills that the technological imperative of the 21st Century will demand. Why has this not happened before? No need to dwell on history, for most of you have personally experienced the rejections inherent in an academically based culture. We live with the social, industrial, commercial and cultural clashes to which it has given rise; a system that enabled a tiny minority to reach the peaks of international research, yet maintained for far too long that other aspect of 19th century education that reinforced an employee culture mentality… with all the lack of personal initiative, and dependence, that is implied. By international standards vast numbers of our young people still opt out of full time education at the earliest opportunity… almost invariably with a sense of failure, and an unwillingness ever again to consider education. Government is showing great energy in proposing a variety of reforms. Whatever your views, the eventual impact of such change will be much reduced unless we all – as a nation of caring, concerned, essentially involved individuals – wake up to the reality that the education of all our young people, is the responsibility of every one of us. You Scots, I believe, are more genuine in your support for education than we English; for long years you have demonstrated your faith in its intrinsic value. We English, I fear are still highly ambivalent in our attitudes towards education – we are not really sure that it is important… at best we may be keen on the education of our own children, but not unduly concerned about the education of other people’s children. And that is not only morally indefensible… it makes extraordinary bad economic sense. 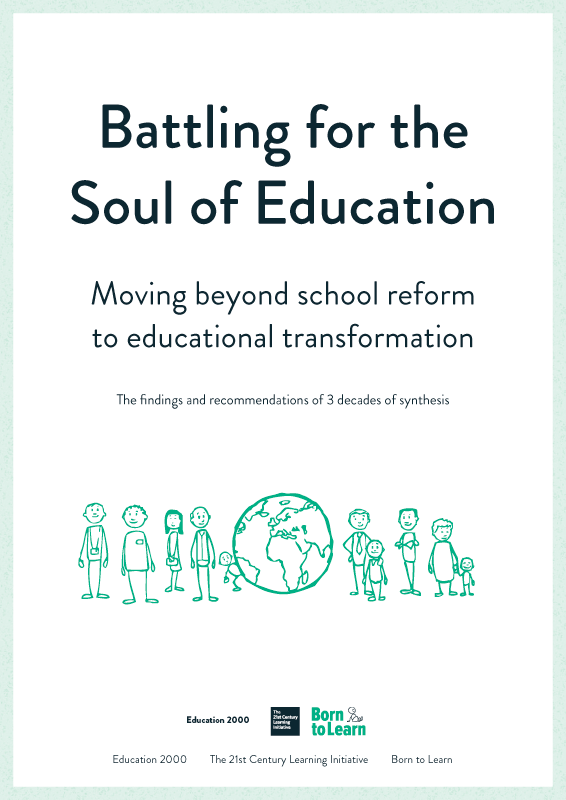 Neither Government, nor anyone else, can create a revitalised, vigorous education system unless we remove this ambivalence… unless we all demonstrate our conviction that education is our front line investment in the future. Maybe you recognise such a child? The clue is in the word teaching. Primary schools encourage children to want to learn, to explore relationships, to treat the world as their expanding oyster… the child becomes excited – and motivated. Secondary schools have been saddled with the artificiality of single subject disciplines, each with a heavy load of content – the teacher takes control, the pupil does as he is told… “It’s the only way to cover the syllabus”. The integrated View of knowledge is easily lost… very many pupils lose interest, they do as they are told because… “teacher knows best” – not because they any longer feel responsible. A vital attribute – that of responsibility – is destroyed; many never recover – learning is associated with failure, and this bugs them for all time. Learning is a personal activity… teaching is something done to you by someone else. We have to bring about a revolution in the practice of education… we have to place the emphasis on building up the pupils’ skills of learning. We have to abolish FAILURE… we have to encourage young people to be involved, to take responsibility… to achieve in whatever capabilities they have; that is how confidence is built up. Achievement. Confident people want to explore, want to carry on learning… are essentially inquisitive, they can manage their own learning… they leave school ready for a lifetime of learning. That is the building we must create if the nation is to be confident of its ability to be flexible, to turn challenges into opportunities, to compete internationally with other smart competitors. That is why we put the word ‘people’ in our slogan – Educating PEOPLE for change. This is why I am speaking to you today. The Nation has started to build a new structure for education – the vision as yet may be indistinct, sometimes confused; but increasingly the need for a Learning Society is being recognised… a society rich in learning opportunities. We have to break down age-old barriers that suggest that education’ is solely the preserve of teachers, working in custodial type institutions. Teacher has to sit down with businessman; trade unionist with industrialist; pensioner with student… put your perceptions on the table, examine them, explore the common ground – create a vision… and then implement it. It will not be easy. But do it we must… at grass roots levels in a thousand and more communities. There has been no shortage of discussion of these matters; it is action which is now imperative. We are a pragmatic race… theory, especially educational theory, makes us uneasy. We like examples. Education 2000 is pledged to do just this to provide lighthouses for the future. We recognise that the issues are complex – they touch all aspects of education and the community. So the Trust is establishing what can best be described as “community laboratories” – whole townships -working together to find new solutions. A “community laboratory” in which literally all sections of society are involved to the hilt in creating rich places for learning. With support from far sighted sponsors the Trust increases the staffing of the schools by 10% for a few short years… all teacher are released for extensive retraining… half of them spend time studying the working practices of industry and commerce; virtually all are trained in the use of information technology… and we provide that technology on a level not so far attempted in the United Kingdom, one terminal for every seven pupils. Fundamental change is dependent on the creation of a highly professional teaching force working to a set of objectives which the community at large endorses and supports. Whatever the theory, whatever are the political exhortations, it is what happens in every classroom that matters – six, seven, even eight times a day, 200 days in the year. Teachers who use their subjects to develop those skills which know no subject boundaries – the abilities to think, communicate, cooperate, and make decisions. These are the empowerment skills. The practice is very exciting. In such a project a teacher can expect an average of 20 days a year for retraining, instead of the normal 2 or 3. I can mention but two aspects of this. Work experience for teachers is even more significant than work experience for pupils, if you want to change the culture of a school – to influence how things actually happen… 20 or 30 teachers in each school with fresh experience of the working practices of the best of British Industry and Commerce… is that not the way to effect fundamental change? Information technology is a powerful catalyst for change; it can transform the learning process. Let me take you into a detailed example. Word processing. In the days of writing your own essays by long hand did you ever consider re-writing an essay once marked by your teacher unless as a punishment? However shrewd and helpful the teacher’s comments, did you put them directly to the test… and actually work with the teacher to improve your first effort? I didn’t… my handwriting skills were too slow, and copying out unnecessary text was a bore. Now think of a word processor… many word processors… so many in a school that any child has access on demand… think of teachers and pupils expecting that essays in any subject are handed in as word processed text… then commented upon, not marked, but returned so that the pupil – working with both the teacher‘s comments and the observations of his friends – redrafts and resubmits the essay. Perhaps twice, maybe three times. And the eventual mark being a measure of the difference between the first and the final draft… not simply a rank ordering of pupil against pupil based on a handwritten first draft. Think about it. It is revolutionary… and its implications are far reaching. It depends on two things. Teachers must be so comfortable with the technology that they will sit down and learn with the pupils. Teachers and learners together exploring how the technology can be used to enhance learning… studying just how people learn. In practice that has to be preceded by much staff training… in fact we spend as much money on training as We do on the technology itself. And the pupils need totally open access to technology… lots and lots of hardware available throughout the schools, and beyond. I will give you proof of what I say; you will not be carried away with the zeal of a missionary… that would be to deny the intellectual objective rigour on which we pride ourselves. Recently I addressed Conferences in Helsinki and Princeton, New Jersey, at which speakers from many lands described initiatives which are addressing identical issues to these – and I was reminded most forcefully of the energy and zest with which they were implementing reform. Through the foresight of many of you in this hall Education 2000 has started its first ‘community’ project in Hertfordshire. A Project drawing together the powerful curriculum thinking from across the United Kingdom and creating an environment in which this can flourish, and be developed coherently. Already, a bare l2 months old, it is exceeding our best expectations as it addresses all the issues of which I have spoken. “I can hardly believe what has happened to my staff“, said one Head last week “It has drawn from them things which neither I, nor they, believed were possible”. “Not until we started to sit down and talk with a group of teachers”, said the Chairman of the Chamber of Trade, “did we really begin to realise that the problems of education were our problems as well. We hadn’t thought about it like that before. Now, together, we will do something about it“. These are early days. The Project, in dealing with such matters puts itself in a most vulnerable position… by inviting people to put their perceptions – prejudices – on the table… noses certainly do get bloodied (our own included!). We want to draw the working practice of school and community together… so 125 of the 250 teachers will be seconded to study best practice in industry and commerce – nationally and locally; think of the potential to create real change within our school common rooms. Britain is missing a prime commercial opportunity in not demonstrating to a world avid for effective means to deliver quality education, the potential of information technology in education. We still have it in our power to develop our early lead in the use of the technology, and show how it can be used to transform the learning process. So the Project, with the help of others, is doing just this. Already more than half of the computer systems have been installed… and that heavy investment in the training of teachers in the use of the technology has already been made. Across all subjects, for all age groups; 11 year olds can now use word processors as easily, and as frequently, as you or I used to use pen, biro… or quill!. The school as a role model for change – pupils living with successful innovation – that is what we are about. Give us time, and you will see that essential shift within education really happening… children will be empowered, they will walk tall, they will be responsible for their own learning. It will be the children who will be in need of a holiday at the and of term, not the teachers! And we will prove that all this can be replicated widely across the land for what will eventually be an annual expenditure of no more than £100 per pupil per annum. The programme may sound radical, but to many of you it will come as no surprise. You know that we have consistently undervalued the powerful curricular thinking of recent years – we, like so many pupils, have been paralysed by a sense of failure. Education 2000 is concerned to celebrate achievement. Letchworth is a good place for our first point of excellence. We are pledged to use it as a beacon. We want to create powerful bush fires of spontaneous activity across the land. The Trustees are now inviting proposals from partners who wish to become involved in a second Project to be located in an urban area which lacks many of the advantages to be found in Letchworth; a third will be inaugurated late in 1989 or 1990. We believe that we have identified all the essential parts of the jigsaw. They fit… and provide a fascinating vision for the future. There is a window of opportunity – powerful ideas and new techniques are within our grasp. Teachers, every bit as much as you, want fundamental change; pupils want change, so does the community at large. Far reaching change that looks forward, rather than backwards. The remaining obstacle is money. Not large in terms of overall budgets, but enormous in terms of money normally released for what is generally regarded as charitable causes. I am talking of money to support powerful initiatives which can show us how to make better statutory provision in the future. Not for a permanent subsidy, but funds to back powerful innovation – whether by Education 2000, or anyone else whose creativity looks to have a sporting chance of success. So far more than half the two million pounds needed to finance this Project has been raised, and the rest will surely follow. But it is doubtful if other initiatives will be able to find such funds without a radical reappraisal of the present levels of sponsorship. Education 2000 will succeed in raising this money because of the dedication of its supporters… but the bush fires will fizzle out like damp squibs unless you will invest in long term education innovation. Don’t let good ideas be still born. The British people – your shareholders – are now so concerned at the need for a vision that they would support a lead given by you. Government cannot, nor should it, be left to do this alone; in a democracy Government is the voice of the people… the people need help to articulate a vision of that ‘educative community’ of the future which, by its sheer excellence, will win for this country-a secure, prosperous and worthwhile place in the 21st century. elaborate upon points within the script.